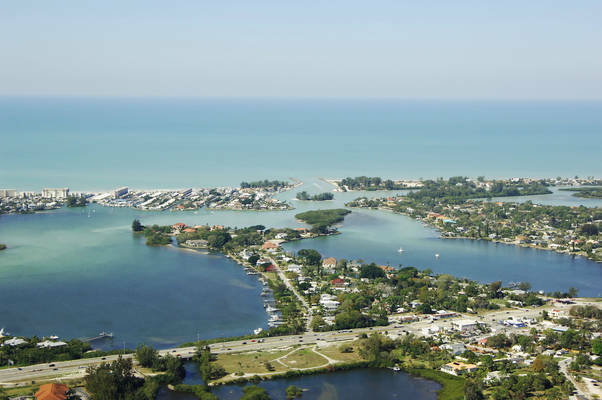 The city of Venice is located on Floridas Gulf Coast about 48 miles northwest of Sannibel Island and 39 miles southwest of Tampa/St. Petersburg. 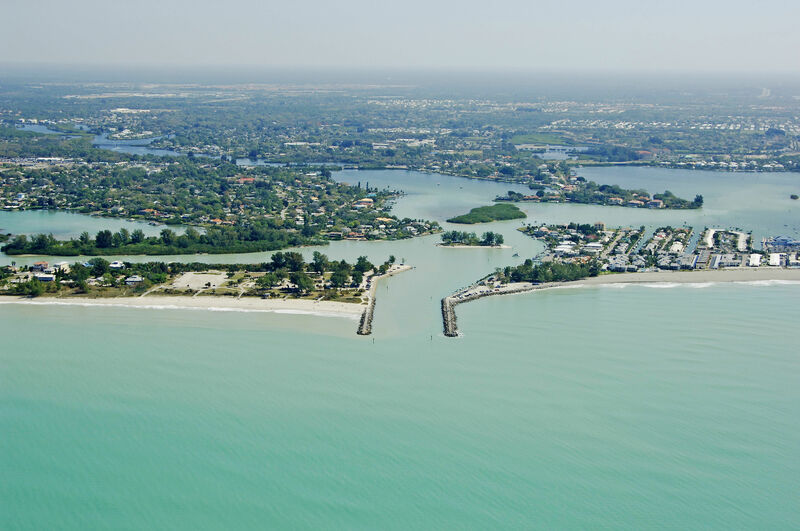 An excellent and beautiful stop on the Gulf Intracoastal Waterway (GIWW), Venice plays host to many boaters every year at its well-equipped marinas. The image above is a view from the west looking east over the Venice Inlet with the jettied entrance in the foreground and Bird Island and the Gulf Intracoastal Waterway toward the background. The first group of settlers arrived in the region in the early 1800s, and in 1923, Venice was connected to Tampa and Miami by a two-lane road that became the Tamiami Trail. The city of Venice was incorporated in 1925. Today, the city of Venice is a bustling tourism center, recreational boating magnet and beachcombers dream. The city of Venice can be reached from three different approaches: The Gulf Intracoastal Waterway from the south, the Gulf Intracoastal Waterway from the north, or the Venice Inlet, which leads out to the Gulf of Mexico from Roberts Bay. From the south on the GIWW, you will first enter the Venice area at green daybeacon 9 at the exit from Hatchett Creek (do keep in mind the two marinas to starboard before your exit from Hatchett Creek are good facilities with transient slips available.) From the north on the GIWW, you will enter the Venice area at flashing green 5 east of Casey Key. 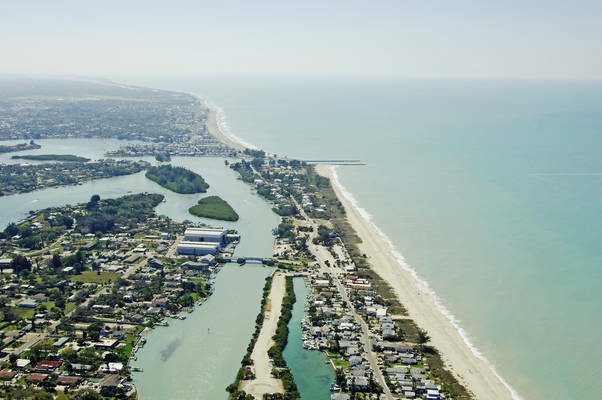 The Venice inlet is well-jettied and carries mid-line depths of at least seven feet all the way to the Gulf Intracoastal Waterway (GIWW) at Bird Island and flashing red 16. To approach the inlet, set a course from the Gulf of Mexico to the are near waypoint 27 06.678N 82 28.370W. Once you have picked up the waypoint, set an approximate course of 75 degrees magnetic to intercept flashing green 1 and flashing red 2 at the north and south inlet jetties, respectively (visible in the image above). Inside the inlet jetties past flashing green 1 and flashing red 2, you will next pick up green daybeacon 3 and red daybeacon 4, at which point you will continue farther east to intercept green daybeacons 5 and 7 before you meet up with the GIWW. In addition to the many water-related activities in and around Venice, ashore boaters will find shops and markets for provisioning, and many excellent restaurants for dining. The local white sand beaches are a popular draw, and there are several good art and history museums scattered about Venice. If you manage to get down to the beach, have a look for some fossilized shark teeth. Venice is know as The Sharks Tooth Capital of the World. Caspersen Beach and Venice Beach are the best place to find a tooth! Local Beaches: Turtle Beach, South Lido Park Beach, Longboat Key Beaches, Siesta Beach, Nokomis Beach, Coquina Beach, and Lido Beach. More info... Here! For a detailed calendar of events and more activities for the area, see the Helpful Links section below. 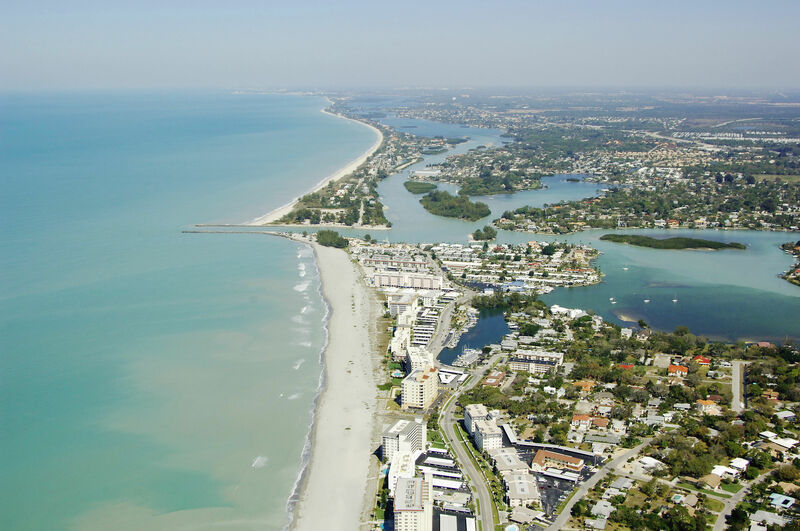 Air transportation is provided through the Sarasota Bradenton International Airport, which is located about 20 miles to the northwest of Venice. You can arrange shuttle or taxi service to and from the airport by visiting the airports Web site, which is listed below in the Helpful Links section. Venice Municipal Airport is close by for those who can arrange civil aviation transport. Venice does not have an organized mass transit system, so in order to get around short distances you will need to arrange for a taxi cab, and for long distances a rental car or airport shuttle is necessary. Many cruisers find that a bicycle fits neatly in between these two. Markets - Venice Farmers Market Check website for seasonal hours! No reviews yet! Be the first to write a review of Venice.